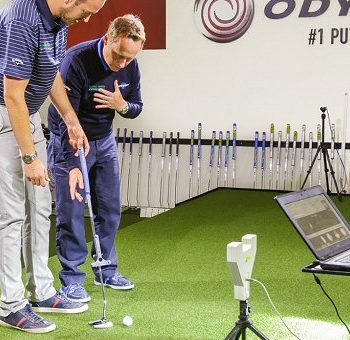 SHEFFIELD, UK – Golfers can now practice every makeable putt on the planet, for real, at the touch of a button. “The straight putt is a myth” said Zen’s Nick Middleton, Tour putting coach, creator of the popular Zen Oracle putter, and co-inventor of Green Stage. “Contrary to what golfers have been taught for years, there is no such thing as a truly straight putt beyond two feet. So if only one in a hundred putts are dead straight, why do most golfers practice their putting on a flat surface? “The humble living room carpet may be convenient, but it doesn’t replicate the challenge of a real golf course. Now, with Green Stage, golfers have the perfect place to learn, practice and perfect the twin arts of pace and green reading. The Zen Green Stage (£16,650 + VAT) offers up to 12% variation in rise and fall slope, variable contours, multiple cups, touch-screen operation, and a quick-change putting surface which can replicate a variety of green speeds. It can also easily be converted to a full-swing platform for other types of practice. Nick Middleton and fellow Zen Green Stage inventor Andrew McCague based the concept on an original idea by the test pilot of the Mach 3 Lockheed Blackbird, US Air Force colonel Horace Templeton, who first created green-reading maps in the 1970s. In September 2014, Zen used similar techniques to help create greens maps at Gleneagles used by the victorious European Ryder Cup team. “Colonel Templeton’s belief was that a golfer’s fundamental inability to read a green is the biggest single barrier to success, and it is one which we share” said Middleton. “There’s growing scientific evidence that highlights the need for practice environments to mimic the real world. With the new Green Stage, both putting coaches and golfers at every level of the game, up to Tour superstars, can now master the challenge of the breaking putt in a consistent, repeatable, authentic environment like never before.